LaFrance Medical Aesthetics: A Bristol, CT – based company that provides high-quality cosmetic treatments that generate natural, subtle yet amazing results. 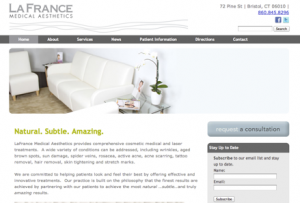 LaFrance clients enjoy an upscale, comfortable environment and access to top treatments for a wide range of conditions. Their website reflects their culture of quality and their simple aesthetic of beauty. Plus it provides valuable information to potential clients and useful tools for scheduling appointments. Rosie’s Laundromat: Rosie’s is a fresh take on an old idea – the laundromat reinvented for the modern world. Offering a full-service laundromat, with state-of-the-art washers and dryers, Rosie’s goes above and beyond other laundromats by also providing a great atmosphere and a concierge service for all your laundry needs. 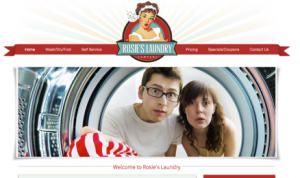 Rosie’s website reflects their spirit of fun, while also inviting customers to come check out their reinvention of the laundromat. Congratulations to LaFrance and Rosie’s Laundry for launching their sites with North Forty Road!